It was Monday night, Kieara’s birthday. A group of us went out, listened to a poetry reading, drank heavily at a few bars and spent some time dancing. I arrived home in the darkness of two thirty in the morning, and still being wide awake, drank some red wine and played on the computer. 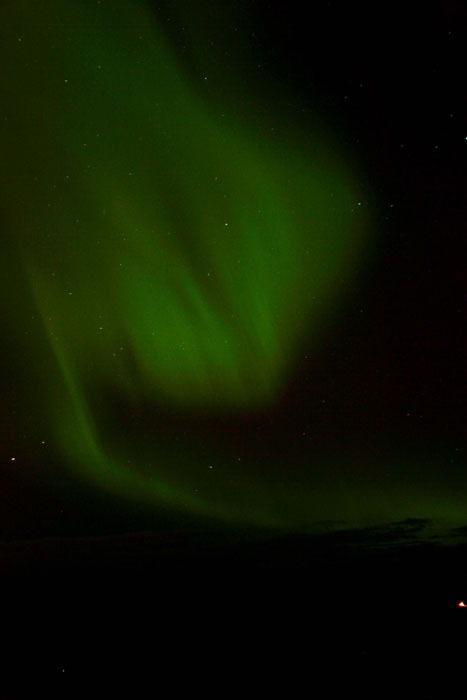 “The Northern Lights are out” came the answer from Matt. Grabbing my camera and attaching it to the tripod, I skipped out the door and down one block to the park where I had first arrived in Anchorage. There it was, sliding across the sky, green and ethereal. Putting the tripod unsteadily down on the grassy verge, I stared up at the sky. “I’m going to need a wider lens,” I thought to myself. The phrase ‘bigger boat’ floated softly through the back of my skull. The spectacle began below the horizon, beyond the mountains and it flowed over the sky, until it disappeared in the light pollution of the city. 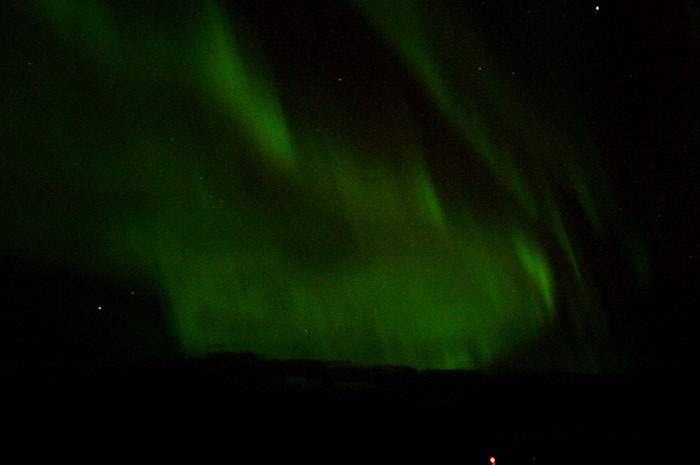 I watched a single green glow swirl up over the horizon and up and up in the sky. I lent back, with my head tilted all the way back, as it slowly moved overhead, until finally I lost my balance, wheeled my arms trying to stay upright, and somehow managed to keep my feet. I guess I hadn’t had enough to drink. My camera could never show was the display was really like. The flowing green went beyond my vision in every direction, and the film could never display the feeling of majesty, or the awe of how much bigger than you this is, of how much bigger the world is than you. I tried to capture it all, I moved the camera about, tried to see if it was possible, but finally I gave up. I sat on the grass, and stared up at the beauty of ion’s impacting into the earth, and smiled.